Housing for slaves varied from plantation to plantation depending on the owners. Most slave quarters were generally arranged in avenues or streets and located behind the mansion or ‘Big House.’ They were strategically placed to give the owner or overseer a clear view of the slaves, so their activities could be easily monitored. The slave settlement at Wessyngton Plantation, however, did not fit this pattern. 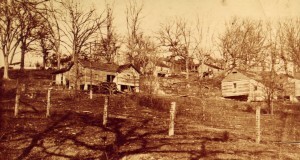 The lack of a clustered settlement pattern at Wessyngton was somewhat unusual during antebellum times. This was primarily due to the hilly topography of the plantation. The scattered pattern gave the slaves at Wessyngton more freedom and made it far more difficult to keep them under constant surveillance. Typically, slave housing at Wessyngton consisted of hand-hewn one-room log cabins measuring 20 by 20 square feet with brick end chimneys. Some cabins were 18 by 36 square feet. Each cabin had log flooring and a loft, where children slept. Each cabin housed an average of six individuals. Family sizes varied depending on the number births, deaths and marriages. This entry was posted on Monday, October 5th, 2009 at 11:16 pm	and is filed under Civil War, Genealogy & DNA, Interviews, Introduction & Personal, Plantation Life, Research. You can follow any responses to this entry through the RSS 2.0 feed. You can leave a response, or trackback from your own site. A great word of appreciation for the writer.The art of performing write-up is excellent. I must appreciate author’s knowledge about the subject.